Yesterday’s Daily Connect (a daily optional activity) for the CLMOOC was an Answer Garden site where folks were asked to contribute a word or phrase about “what connecting means to you.” Answer Garden displays the answers in a Word Cloud — not quite beautiful but it is collaborative. I love reading the many ways we nurture our connections. This week’s theme of Reciprocate with Generosity in the Making Learning Connected MOOC reminds me of Tuesdays. You see, most Tuesdays, I try to take part in the Slice of Life, a weekly writing challenge hosted by Two Writing Teachers. Every Tuesday, many educators write a bit about their day — a slice of time, put into reflection. As a writer, I like that open invitation to write, and so I often do. But what really interests me is the interaction at the blogs (sometimes, like during the Slice of Life Challenge each March, there are more than 100 writers involved, sometimes nearly 200) as people leave comments, and spark conversations — asking questions, wondering about the world, making connections. It’s unlike any other year-long writing project that I have been involved in. Readers are engaged. Writers react. Conversations happen. Ideas, shared. As folks in the CLMOOC this week engage in different activities that honor each other — and there have been many cool media projects already going — I’d like to use this Tuesday’s Slice of Life post to introduce my CLMOOC friends (we use #clmooc hashtag) to my SOL friends (we use #sol16 hashtag), and vice versa. While much of SOL is located on individual blogs (you can find links when you go to each week’s call for Slice of Life posts at Two Writing Teachers), much of CLMOOC takes place on Twitter and in a Google Community, and on Facebook. If some of my CLMOOC friends now begin writing for Slice of Life (a few already do, I am pretty sure) and if some of my Slice of Life friends peek into the creative collaborative projects going on this summer (a few already do, I am pretty sure), then I would be very happy indeed. 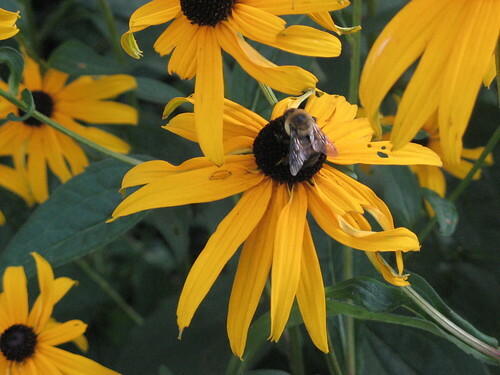 Cross-pollination of writing groups is always a good thing. 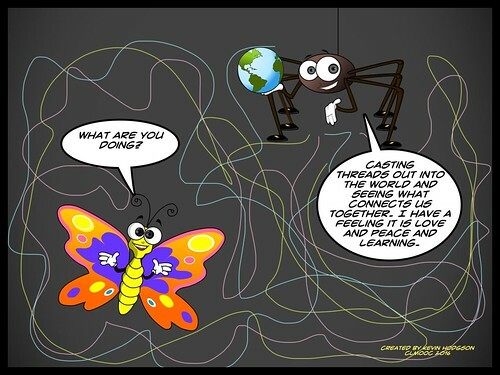 As we enter into the second Make Cycle of CLMOOC, with the theme of “reciprocating connections with gratitude and generosity,” an impromptu collaboration that began last week with Make Cycle 1 is sort of wrapping up. (I say “sort of” because others might still add into the mix). 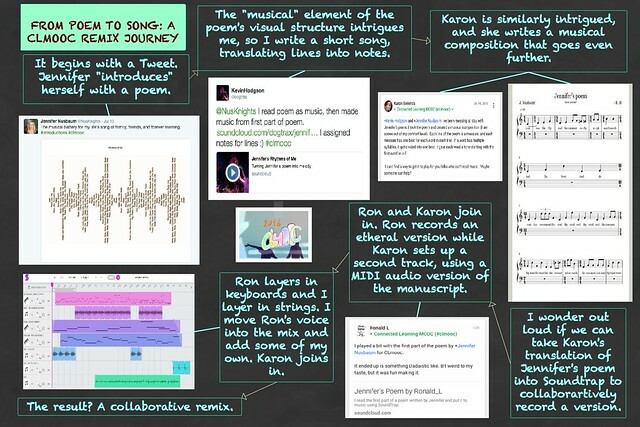 It began with a poetic introduction by Jennifer N. and led to the conversion of text into a musical manuscript by Karon B. and then that inspired a collaborative recording by Karon, Ron L. and myself in Soundtrap. Over the course of a few days, we read and re-read Jennifer’s poem, shaped it as a piece of a music, struggled to find the right way to honor her words while still creating something new. We zigged and zagged a bit, working around our own limitations as musicians and of Soundtrap. We communicated and planned via messaging, trying to articulate a vision of what we were hearing as we were reading. For me, this process of closely reading Jennifer’s poem, and then finding ways to honor her writing with music (her introduction poem is musically themed) was a perfect example of how CLMOOC dives into the mix of both the individual writer (Jennifer) and the group collaboration (Karon, Ron and myself). I made the flowchart above to try to track the process — to make visible the steps along the way. This visual is helpful to me as a reflection point, and is one way to recognize and celebrate the process of collaboration. Just listening to the final track, even if you know Jennifer’s poem, would mean only a glance at what really went on begin the scenes. We’re ending the first Make Cycle of the CLMOOC (well, ‘ending’ is the wrong word entirely, since anyone can jump in whenever they want and that is the start of the CLMOOC) and before we shift into the second Make Cycle, I want to catch my breath. You probably do, too. That’s OK. It’s been a flurry of activity, with introductions coming in from all over the world and in all sorts of media forms. 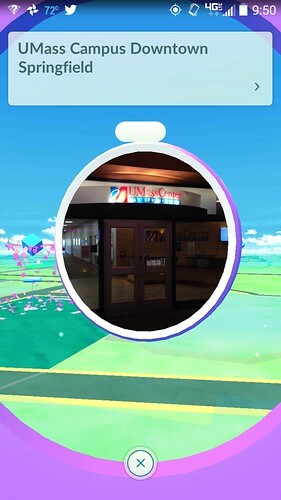 The opening days of places like CLMOOC are like that. Flurries. Waves. Tides. Firehose. You name the metaphor. It probably fits, in some way. The question is: Will folks hang around beyond the initial excitement? 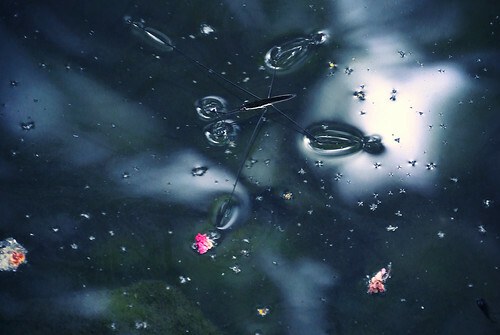 I hope so, because Make Cycle 2 (which will kick off with a newsletter later today from facilitators Susan Watson and Helen DeWaard) is all about circling back to the first Make Cycle and finding other people to connect with .. to reciprocate with generosity. This can take many forms, as Susan and Helen will explain, but the idea is to try to go deeper with our networks, and not just fall back on the +1 button, or the thumbs up, or the like. How we make our connections go deeper, and nurture sustainability of connections, is the underlying current in the CLMOOC in the coming days. Engaging in conversations, honoring someone else’s work through remix, listening to perspectives, tapping into collaborative projects … it’s all about understanding the World through the collective experiences of others. Listen, the CLMOOC is not necessarily a true reflection of the World — we’re mostly a narrow a splinter of humanity with common values — but it’s a start. 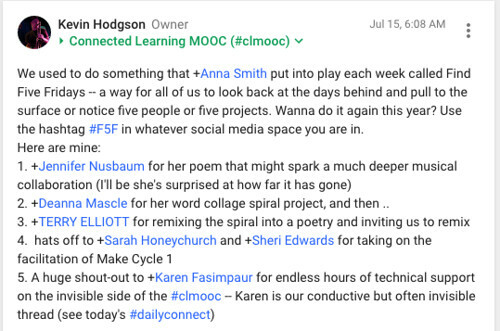 Want to see the kind of connections going on already in CLMOOC? 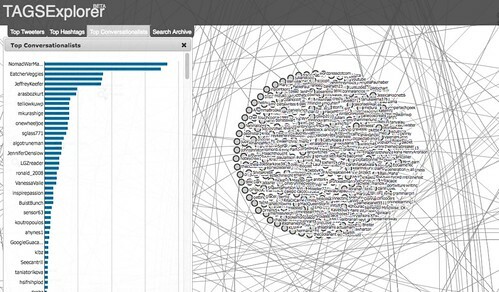 Check out this TAGS Explorer. 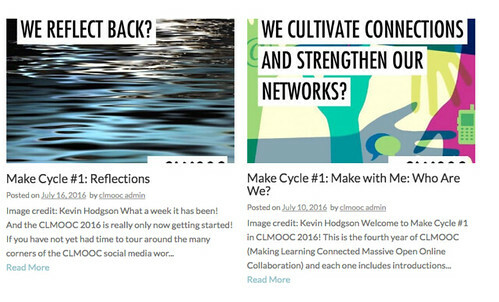 You can read all the CLMOOC newsletters here. I hope to collaborate with you in the coming week, one way or another. One easy entry point: Leave a comment. Ask a question. Write a poem. 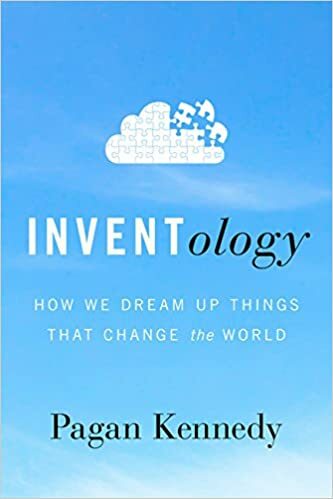 My wife picked up an advanced copy of Inventology: How We Dream Up Things That Change the World by Pagan Kennedy at a conference for librarians (you should see the bags of books she brought home), and I was intrigued. I was quickly sucked into Kennedy’s interesting exploration of how inventions come to invent, and how their creative visions of the world, particularly imagining the future, help pave the way for progress through tinkering. Kennedy explores through stories many inventions, but she also takes a step back to provide the larger picture of how ideas come to be, from the synergy of crowds feeding off shared ideas, to solving problems that aren’t even problems yet, to random discoveries by inventors with attentive vision, to the ways that education and political systems can encourage or discourage the fertile minds of inventors. My big take-away is that we need to do more to give people — I am thinking of students — the possibilities for exploration on their own terms, and anticipate that there just might not be immediate results or maybe they will never get results. Most invention ideas go nowhere in the short run, but sometimes, those nowhere ideas lead to something else, and then …. who knows. It might lead to an idea that can change the world. Inventology is worth a look for anyone interested in the mindset of inventors, and also, for anyone wondering how to set the stage for the next generation of inventors. The question of how we, as teachers, give that kind of creative space to students in this era of standardized learning and testing is a critical one, but I see gains in Maker Spaces in libraries and engineering programs in elementary schools and more. 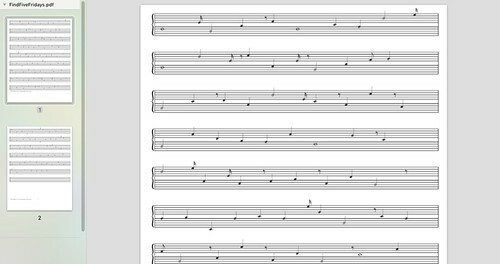 My friend, Wendy, reminded me in our Google Plus community of a site that allows you to input text and it will convert the text into a musical composition with a companion music file. This is how I did it this morning with a short bit I wrote. First, I wrote up a Find Five Friday for #CLMOOC — I found five people that I wanted to recognize or honor this morning. It’s another way that connections get made in CLMOOC. Next, I copied the text of my F5F and popped it into the engine of P22 Music Text Composition Generator. You can choose an instrument, and time signature, and give your file a name. When you click “generate,” it creates a musical composition. It also creates a companion MIDI music file. NOTE: Chrome did not play nice and I had to jump over to Firefox and allow Flash to be used. Since MIDI music files are very specific about where they can be played, I wanted to convert it into an MP3 file for sharing. I used Zamzar, an online media converter. 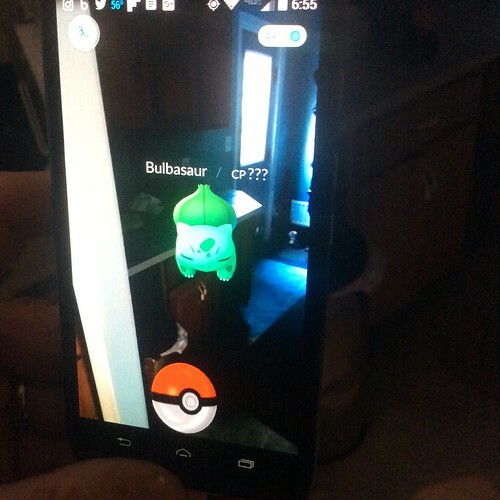 It worked like a charm. I then uploaded the MP3 file (I had chosen the Vibraphone as the instrument but there are other variations … all sound sort of electronic-y but what can you do?) into Soundcloud, and used a screenshot of the composition as my image. How about you? What text can you make into music? Can you honor someone else’s text by turning it into music? Last night was the first Make with Me live Hangout session for this year’s Making Learning Connected MOOC (Massive Open Online Collaboration), and it was such fun to talk about the CLMOOC and various Make projects, and to focus in the huge wealth of introductions and engagement that folks are involved in already. The title to my post is a reference to the concepts of Hanging Out, Messing Around, Geeking Out that forms the underlying nature of Connected Learning, where research indicated young people’s interactions with technology seemed to fall within some general ways of thinking. HOMAGO is often how it is referred to in some Connected Learning circles. It comes from this book by Mimi Ito and others. Come join us. You’re always right on time. 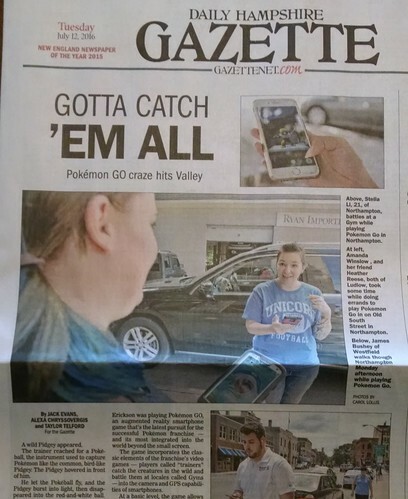 Come geek out with us. In my latest blog post over at Middleweb, I explore the use of digital portfolios as a tool for student curation of their own writing over time. This was a pilot year for me, with my own professional digital portfolio, and my students, with a digital writing portfolio.